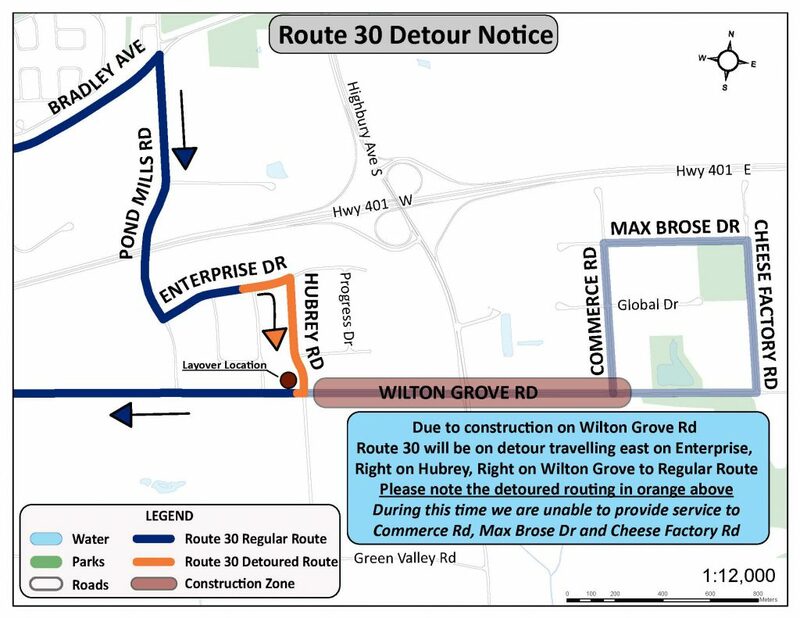 Due to safety concerns related to travelling through the construction zone on Wilton Grove Road between Hubrey and Highbury, London Transit will be detouring Route 30 effective immediately until further notice. East on Enterprise, right on Hubrey, right on Wilton Grove to regular route. In order to minimize the impact of the detour on the schedule west of Hubrey, buses will layover on Hubrey at Wilton Grove to arrive at stops west of Hubrey according to the current schedule. Please note the layover will be approximately 12 to 15 minutes. During the detour service will not be able to be provided to Commerce, Max Brose and Cheese Factory Road. The closest bus stop will be at Hubrey and Wilton Grove southbound. If you have any questions on the above detour, please contact our customer service representatives at 519-451-1347.